Take a thali made of any metal such as copper, steel, gold, silver or brass, of any shape and with less designs as it need to decorate much. Let your guest carry this beautiful Meenakari Double Peacock Plate as Return Gifts for Marriage. Also ideal return gifts for grahapravesham, seemantham, poojas and other festive functions. Check with us for more details! 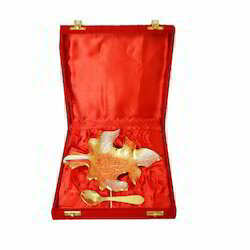 Leaf Shape Platter can be availed from us at market leading prices. Fine Decorative Marble Elephant Plate Available In Different Designs & Sizes. Size :- 8 X 8" Inches. 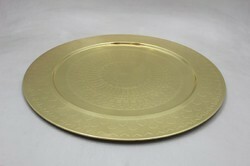 We are leading manufactures all kind of handicrafts items.